Composting with worms allows you to turn kitchen scraps, paper waste and cardboard into nutrient-rich soil for your plants. The Worm Factory 360 composting system makes the entire process quick and easy. With a thermo siphon air flow design, the Worm Factory 360 increases the composting speed. Composting with worms allows you to turn kitchen scraps, paper waste and cardboard into nutrient-rich soil for your plants. The Worm Factory 360 composting system makes the entire process quick and easy. With a thermo siphon air flow design, the Worm Factory 360 increases the composting speed. Now you can produce compost much faster than traditional composting methods. Master Gardeners agree, worm castings are one of the richest forms of fertilizer that you can use. The Worm Factory 360 can be used indoors or outdoors allowing year round production. Now composting is no longer limited to backyards. The Worm Factory 360 is odorless making it great for apartments, kitchens, garages, porches and more. Instructional booklet featuring easy-to-read tips and directions plus in-depth information on microorganisms. 8 oz. container of Glacial Rock Dust which helps to speed up the composting process as well as adding valuable minerals to the soil. Let the Worm Factory 360 do the work for you! Instead of spending time turning piles of compost yourself and removing worms by hand, the multi-tray system separates the worms from the compost so you don't have to. Also, because the worms continually eat through the waste in the stacked trays, compost is produced at a faster rate than traditional methods of composting. Its compact square design gives the Worm Factory 360 the smallest footprint of all worm composters. 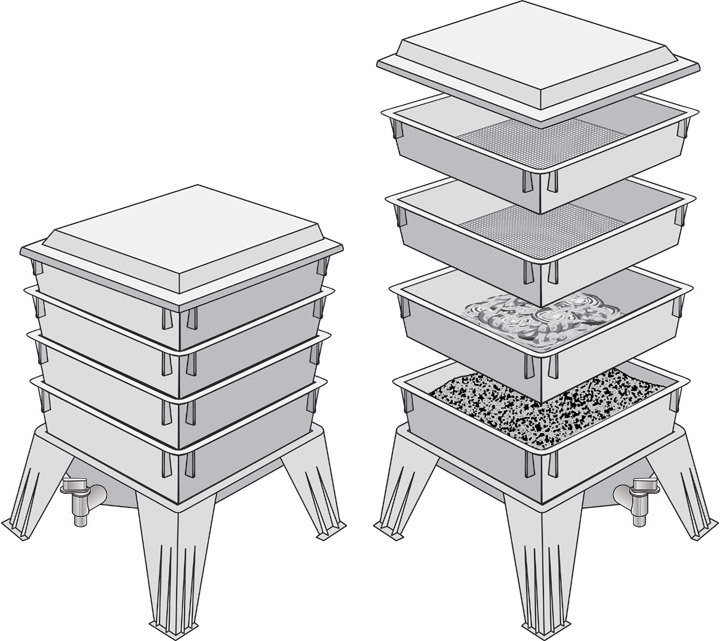 The Worm Factory 360's tray stacking system allows it to hold the largest capacity of compost in the smallest amount of space, making it perfect for anyone with space limitations. The Worm Factory 360 is simple to operate. When full, each tray weighs only 12.5 pounds, making lifting and arranging trays effortless. The included 16-page instruction manual makes setup fast and easy and gives detailed tips on how to best manage your Worm Factory 360 year-round. When managed correctly, the Worm Factory 360 is virtually odorless, making it the perfect composter for apartments, kitchens, garages, porches and more! The best compost for your garden is all-natural, nutrient-rich compost produced by worms. The Worm Factory 360 creates the high-quality compost that will help your garden thrive! Allows 10 times more air circulation than similar composters. Need some worms for your Worm Factory 360? This was easy to setup and easy to use and the video way very helpful. I'm amazed at how quickly the worms turned food scapes into useful compost. So far so good. Only 1 month in, but the worms are happy and there is no smell. We keep the worm factory in our laundry and can't wait to start pulling out the first tray of compost. Very easy to use. I've been successful with worm composting before, but this time I'm in Dallas. I can't put the worms outside (heat even in shade killed my first batch). Inside, I can't get rid of gnats of some kind, no matter how closely I follow the directions. If I have to compost any less stuff to avoid the other critters, then it's literally not worth it. However, I WILL solve this problem with perseverance and creativity and maybe some help from others. I'll keep this review updated as things get better. I will be starting a worm composting project with my granddaughter. The Greenhouse Megastore made this possible. I searched the web for information and pricing. I found the Greenhouse Megastore to have the best price for an excellent product, the Worm Factory 360. I thank you again for the product and service I received. I tried worm composting in the past in a homemade composter. This is much better. Worm composting enables composting in the winter indoors. I ordered this unit, and an extra tray. It arrived quickly, had excellent directions and a video. The unit also has tools and bedding material. I ordered worms from Wisconsin worms. The worms were shipped on Saturday and arrived on Monday in perfect condition. They are now settling into the bin, eating our kitchen scraps which I have been freezing in anticipation.I mainly wanted it for composting, but have also learned that the red worms are good for fishing. Perhaps I can trade some worms for walleye.